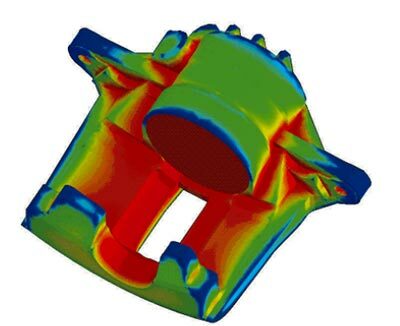 ..: Case Studies - Simulation of an Acid Zn Plating Process for a Brake Caliper :..
Sulphuric acid Zn plating processes produce highly non-uniform current density and layer thickness distributions. In case of corrosion protection layers, this is not the major issue. However, a significant problem arises due to the fact that plating efficiency is zero for low current densities and at high current densities, there is a strong tendency for dendrite formation. 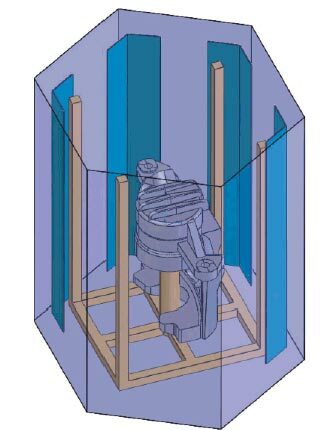 In order to obtain a better control over the layer thickness distribution for the Zn-plating on a brake caliper part by means of auxiliary anodes and screens, a dedicated plating cell was build (figure 1), rather than putting the parts on a rack. The highly non-uniform current density obtained in the not-optimized plating cell is plotted in figure 2. Figure 3 shows the corresponding simulated layer thickness distributions, including a very accurate forecast of areas not receiving any zinc coverage. An entire trial and error run (cell design - plating - measuring layer thickness distributions on the parts) takes approximately 2 days, while defining the plating cell configuration as shown in figure 1 takes only one or two hours, with another 10 minutes to compute the resulting layer thickness distribution (figure 2) with Elsyca PlatingMaster. Hence, using Elsyca PlatingMaster will dramatically reduce the number of experimental trial and error runs, providing the 'right first time' design immediately. Figure 1: Dedicated plating cell for the brake caliper part, with 6 insoluble anodes (4 shown). Figure 2: Simulated current density distribution the brake caliper part (blue zones correspond to elevated values). Figure 3: Simulated layer thickness distribution on the brake caliper part (dark grey corresponds to areas without any deposit).